Are you a bus driver looking for a new job in Liverpool and Merseyside? Maghull Coaches are on the lookout for PCV drivers to join our thriving bus and coach hire company. Drivers will be expected to undertake a wide variety of work including school services, airport transfers, social excursions, business trips and more as our customers require. We pride ourselves on delivering a reliable and efficient service, so extensive knowledge of the Liverpool and Merseyside region is a must. 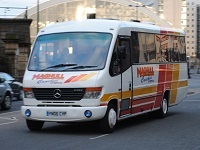 We are looking for friendly, courteous and professional drivers to ensure Maghull Coaches continues to provide the fully managed transport solutions expected of us. You should have good communication skills and know how to get passengers to their destination in a timely fashion. Drivers must hold a category D driving license and a PCV license. An enhanced DBS check will be done by us should you not currently have one. Maghull Coaches have multiple jobs available for both part-time and full-time bus drivers serving Liverpool & Merseyside. Part-time positions will involve working 20-23 hours on mornings, afternoons and weekends. Full-time positions are 40+ plus hours and you are expected to work 6 days every other week. We offer a competitive salary rate from £8.50 to £15.75 per hour depending on your experience and contract type. If you feel like you meet the criteria of our Liverpool driving jobs, please get in touch for more information. A wide variety of work - every trip is different!